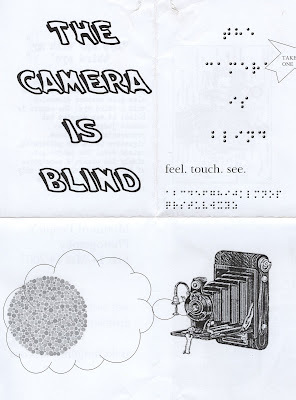 The exhibition that would prove to be the inspiration for this website, The Blind Camera was a callback to the forgotten 'tactile' element of photography. The idea was simple: to create a series of pictures by and for the blind (really, when you think about it, a neglected demographic as far as photography is concerned). A colleague of mine, a former radio presenter who happened to be blind, used to type up scripts on a braille typewriter, which he showed me how to operate. Around that time I hit upon the idea of creating a braille 'image': a thematic sentence, written in braille, that would evoke an image. To the untrained eye (or finger), it would simply look like a pattern of dots, whereas inside would be hidden a vivid image. I had my colleague help me to create 8 of these 'braille images', which I then mounted into proper matboard picture frames and presented as the 'real' photograph. 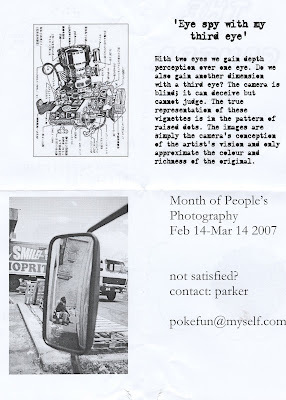 On the other side of the same frame, I pasted an ersatz 'visual' representation of that vignette - that is, what the 'braille image' might evoke or look like to a disadvantaged 'sighted' person - and surrounded it with braille paper on the frame itself. I wanted people to feel the pictures as well, so I hung them unusually low, below the sightlines of most people, so that they would be obliged to grasp the frames to get a closer look, and in so doing feel the braille with their hands. The result was a tactile, textural photo experience. 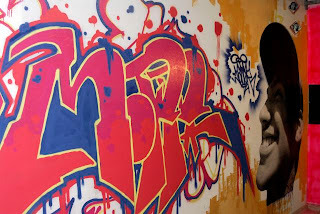 The show was held at the Arternative Gallery on Long Street, in a basement space converted especially for the occasion. The theme was 'I spy with my third eye'. I proposed the blind camera as being that third eye, because since it can only capture and not interpret, in a sense it is blind as well. With two eyes we gain depth perception over one eye. Do we also gain another dimension with a third eye? The camera is blind; it can deceive but cannot judge. The true representation of these vignettes is in the pattern of raised dots. The images are simply the camera's conception of the artist's vision and only approximate the colour and richness of the original. 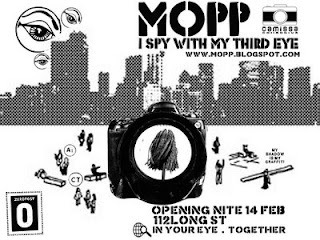 In addition, this year's MOPP presented for the first time a Portable Exhibition: a series of half-size posters, with images and interviews (collected by myself and others) from select members of the Camissa Collective. The Portable Exhibition was made available to libraries and community centers around Cape Town and beyond, with the goal of expanding MOPP's mandate of connecting and empowering people through still images. Read more about MOPP & the Camissa Collective here. Read about the origins of the name Camissa here. Read archived interviews with Mandla Mnyakama, Nadia Brown, Francois Raubenheimer and RealRozzano. Posted by the blind camera at 5:42 a.m.